Dance your way to a healthier and happier life. Dancing the Rainbow was created and designed by two Irish women, Antoinette Spillane, a yoga teacher and voice teacher with a background in the creative arts and Lani O'Hanlon a dancer, colour therapist and writer from a show business background. They have been running the Teacher training courses since the early 1990's. Both have been teaching and facilitating courses together and individually for over twenty years. These workshops are held in a beautiful sensuous and peaceful setting. We always start with stillness and end with stillness. This ensures that we remain grounded throughout this work. We create a safe and luxurious space where people can express who they truly are. Allowing them to express their hopes and desires. We work with the seven colours of the rainbow. Each colour is related to a particular chakra (energy centre). For example red for the base chakra while indigo is the colour for the third eye chakra. Using music from around the world we explore the different areas in the body relating to the chakra system. The area around the hips is the sacral chakra and Egyptian music and movement contains highly sophisticated knowledge of this chakra. Working with colour and movement helps to free up any blockages in the chakra system. Once we have become aware of where and how we are blocked we can work to release these blockages and become happier and more creative in so many ways. Our lives become more interesting and fulfilled. We encourage participants to explore different gestures and movements which they would not normally use and see what they can learn about themselves from this. This work is done with a wonderful sense of fun, while drawing back any criticism or judgement of ourselves or others. 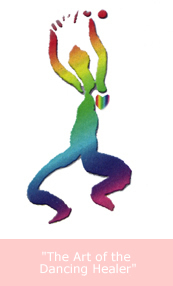 "Dancing the Rainbow is an unusual workshop but in a positive way. You dance to the rhythm of the music and vibrations of the different colours that make up the rainbow. be prepared to be tired at the end of each day, but it is a nice tiredness. It is a great way to dance away your blues, celebrate your joys, your blessings, your gifts and just being alive. It made me feel grounded and part of the flow of life. Try it for yourself!" "My inner child was happy, playful and free with Dancing the Rainbow."